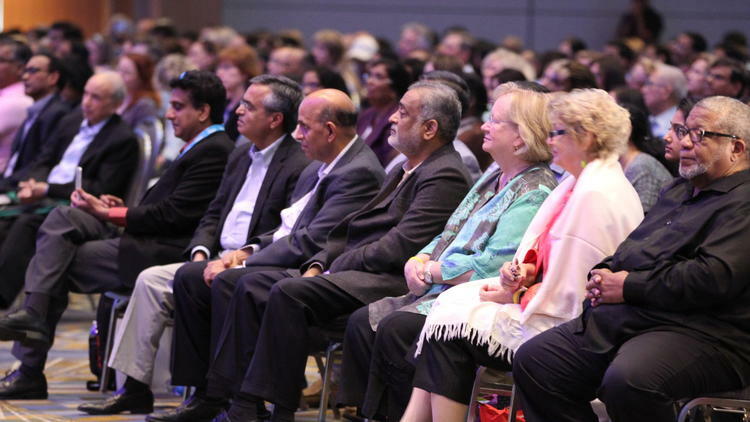 Detroit, MI: On June 4, 2016 more than 1,000 people assembled at Cobo Conference Center in Detroit Michigan for the first of three National Heartfulness Meditation Conferences across the United States. The occasion marked the first meeting where the Heartfulness meditation founder and global leader Kamlesh Desabhai Patel was physically present to lead the Heartfulness Meditation with practitioners. The day long free event featured several guest speakers from gamut of industries ranging from corporate America to healthcare, local and state governments and TV radio personalities who all shared a common belief that practice of meditation has yielded enhanced outcomes not only in their own lives but also in the lives of those whom they touch through their respective vocations. Among the group of special guest speakers were Gopi Kallayil, Chief Evangelist for Google, Author of “The Internet to the Inner-Net” and leading voice on encouraging yoga and mindfulness in the workplace; Dr. Partha Nandi, Chief Health Editor for ABC Detroit; John D. Carter, PhD, President and Founder, Gestalt Center OSD; Lila Lazarus, well known TV personality, award winning journalist and news anchor in Michigan, Maryland and Massachusetts and musical performances by flute maestro Shashank Subramanyam.